Let's face it. If you are from the United States, your perception of mall food is Hotdog on a Stick, Cinnabon, and maybe a McDonalds. The malls maybe at best about 2 stories. For the most part, malls in the United States are based around the concept of a cornerstone department store with a number of retail outlets. In the States, if you've been to one mall, you've been to them all. With all the staggering rhetoric about competition and choice, the selection of stores in the USA are woefully minimal. There are only so many times I want to walk into the Gap. So, what about Thailand's malls. They are almost contained cities. Central Mall, which has several locations, can be as high as 7 to 10 stories. There are grocery stores usually located at the ground level. There are high end retail outlets on par with The Grove in Los Angeles. There is a mall for everyone, even specific regional locations that are usually only visited by local Thais. 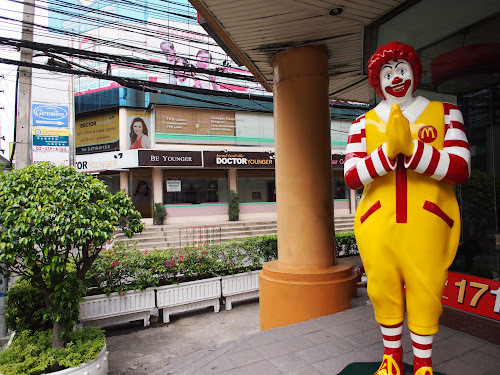 McDonalds is in Thailand, but their menu is a little different. They do have the Big Mac, but they also have a pork burger, a version of jok (rice gruel), and other unique items not found in the USA. Ronald McDonald also is displayed with a Thai wai. At one of the regional malls, I had an observation. You can see an interesting juxtaposition in this photo. This was at another regional mall a few miles away from my apartment. With Ronald McDonald in the foreground smiling, you got medical doctor offices in the background. I think that is for plastic surgery. So, after you get fat with American food, you can get liposuction. Bangkok malls are enclosed self contained entities. Where you are located often dictates how you live. People go to malls in Bangkok not only for the retail options, but also for the air conditioning. It's cooler to be in the mall--in a literal sense. This is one observation. The other observation is food. Food has a central role in Thai life. They don't say how are you in Thailand. They ask if you have eaten. Food is more high end in the Bangkok malls. You have a range of a version of indoor street food types of food courts, and then you got this growing trend of Japanese restaurants, many of them frequented by Thais not Japanese. The Nine Mall next to my apartment seems to be heavily dominated by these Japanese restaurants. Unfortunately, it isn't enclosed, and so it doesn't seem to be as popular as enclosed air conditioned malls like Central. There is a ramen joint here, a Japanese bakery, a tonkatsu place, izakaya, and a Japanese curry place as well. There is also a 60 baht per item Japanese place for kitchen and home items. Everything in the store is basically 2.00 USD. Not a dollar place, but close enough. The Nine is basically a mall for food venues. The first two floors are dominated by food venues. No Gap. No Hot Dog on a Stick. I go to this ramen place at the Nine. The decorations are Japanese. In fact, the menu is in Thai and English. The ramen isn't that bad. It's better than some of the places in Los Angeles. This is what the standard bowl looks like. 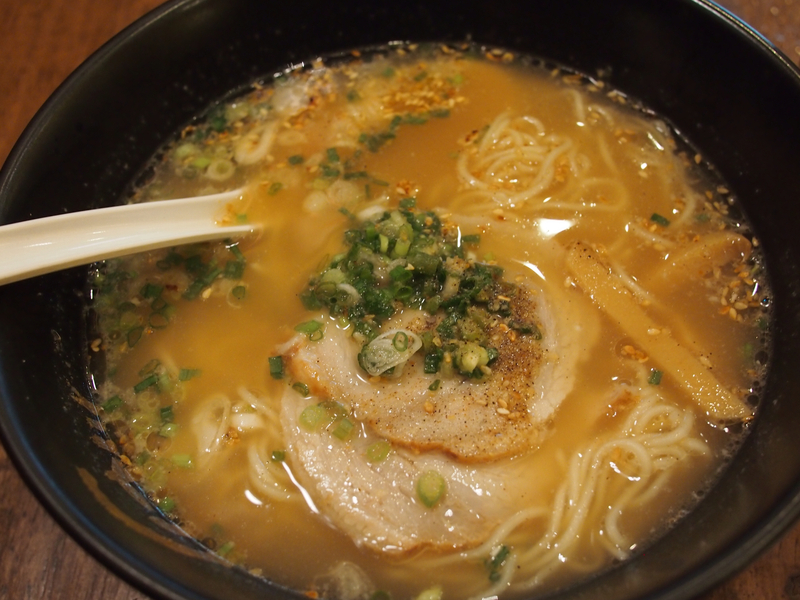 They start with a tonkatsu base or pork based broth with your standard ramen noodles. You have options to have more wakame or more chashu pork. Overall, it was not too salty, and the special comes with a Pepsi and a side of gyoza. It's all for about 150 Baht. Next door to this place is an izakaya. They do sushi. I got bored, and walked to the mall for sushi. How convenient is that? So what do you get in an izakaya in Bangkok. This is what you get. 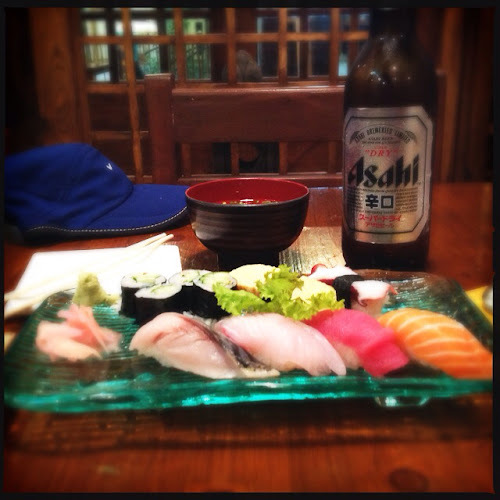 This meal, including the tall Asahi, put me back by just under 15 dollars. For a dinner, it is low. It included miso soup as well. It's more of the price range of the lunch menus in Gardena, CA. So, if you are into Japanese food, or if you are Japanese, Bangkok might be the foodie place for you. The costs are actually not entirely cheap, but then if you are into Japanese food, you know that there has always been a cost. By the way, did I mention this is mall food? 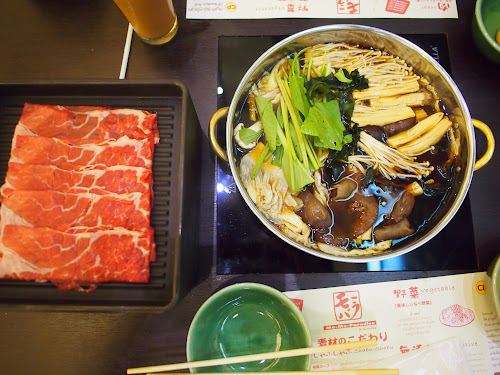 There also seems to be a preponderance of shabu shabu buffets in Bangkok. At the Central Mall located near my location, there is a Mo Mo Paradise place that serves it using a tsuyu broth, instead of a clear broth. You dip the shabu shabu in a beaten egg. Overall, the quality isn't too bad. The fact that it is all you can eat astounds me. There are all you can eat shabu shabu places in Gardena, CA. The cost is usually around 30.00 USD per person. On the other hand, they have unlimited Kirin beer as well. 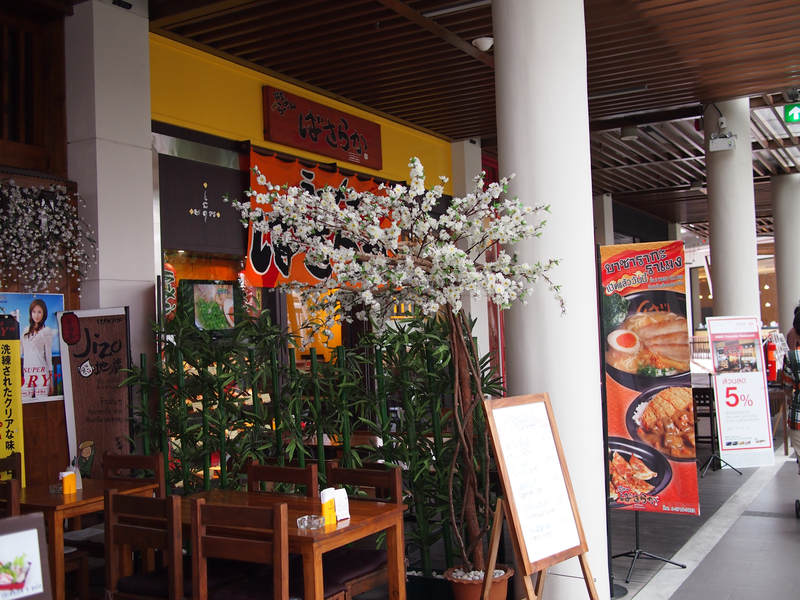 If you take into consideration costs, Japanese food in Bangkok isn't too bad. Now, there are uber-high end Japanese venues in Bangkok. We're talking about places that might compete with Nobu in Los Angeles. So, this is mall food in Bangkok. No wonder people hang out at the malls here.